Ottawa First Aid is the leading training service provider of first aid, cardiopulmonary resuscitation (CPR), and automated external defibrillation (AED) training in the Ottawa area. All courses are overseen by the St Mark James and taught by St Mark James certified instructors. Stand-alone classes, private classes, and refresher courses are also offered by Ottawa First Aid. Stand-alone classes for basic first aid or CPR and AED are offered to trainees who do not want to complete the entire training course. A complete list of class schedules are available on the Ottawa First Aid website. Enrolment may be completed using the on-line application form below or via e-mail. Telephone calls and walk-ins are also highly encouraged by Ottawa First Aid’s very accommodating staff. Ottawa First Aid offers classes in numerous training locations throughout the area. Training facilities are easily accessible and convenient, within walking distance to public transport and restaurants. Trainees are able to complete a training course are awarded a certificate from St Mark James, valid for three years throughout Canada. Trainees may also renew expired certificates through refresher courses offered at least twice a week by Ottawa First Aid. AED pad position on an adult victim. There are three CPR training course levels to choose from: A, C, and HCP. All include CPR and AED for adult victims, while C and HCP also include CPR and AED for child victims. Basic first aid for choking and bleeding injuries is also included. 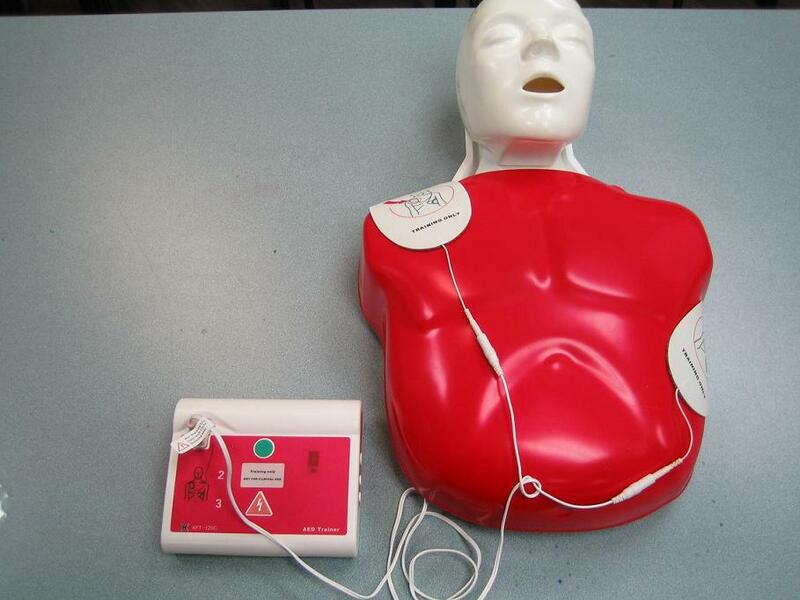 Training courses use the American Heart Association’s Basic Life Support (BLS) guidelines in teaching trainees how to rescue victims of cardiac arrest. Studies have shown that immediate chest compressions following a collapse have increased the survival rates of victims. The main steps in the updated BLS guidelines are “push hard” and “push fast” – regarding chest compressions. 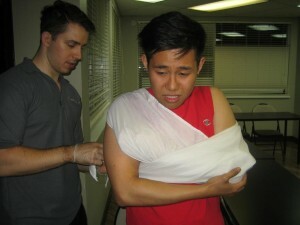 Stand-alone basic first aid classes are also offered by Ottawa First Aid. Trainees are taught a number of first aid skills to help themselves or others in emergency situations. One of the most common requested topics are choking emergencies. Basic and comprehensive first aid training is divided into either one day or two day courses. Check with your employer or school to determine which school you need. Customer service representatives at Ottawa First Aid can also help determine which is the right course for you. Training course rates are offered at the lowest rates in the area. Rates are inclusive of taxes, certificates, and St Mark James registration fees. Training manuals and equipment as also included in the initial enrolment fee. Should a trainee need to drop out of a training course, full refunds are available as long as a 72-hour notice is provided. If you are choking, do your best to stay calm. If people are around you, try your best to get their attention by grabbing your throat and showing them you are choking. If you can cough forcefully, try to remove the obstruction by coughing. If you can no longer cough and nobody is around to provide you with help you can use abdominal thrusts on yourself.